This version adds twelve new camera support and minor bug fixes and improvements. Color profile data updated for Olympus, Panasonic and Sony cameras. Baseline exposure indication is added to EXIF panel, see EXIF panel Preferences. Capture One v10 added to list of known applications. EXIF Panel: scrollbars are now visible only when they are necessary. GlobalAlternateHandler script description removed from docs because this setting is no longer in use. Thanks fo rth eawesome application love it! I shoot with and X-Pro2 and would love it if you could start to support the compressed RAW files. We independetly support Fuji compressed files for quite some time now. 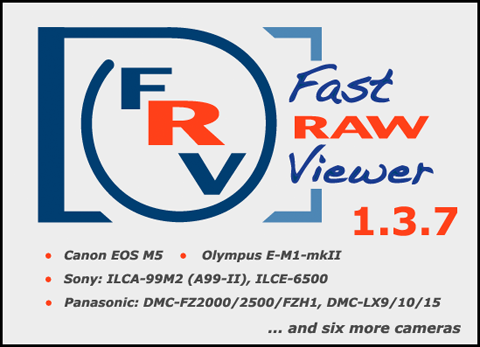 Please try it, and if something does not work for you, please upload a sample raw that FastRawViewer can't display. You can use our e-mail support@fastrawviewer.com for any communications you want to keep private. We're focused on from-camera files (RAWs and JPEGs) and on photographic tasks, specific for from-camera files (exposure evaluation, wb/contrast/exposure adjust, etc). So, other (processed) formats are not on top of our TODO list.